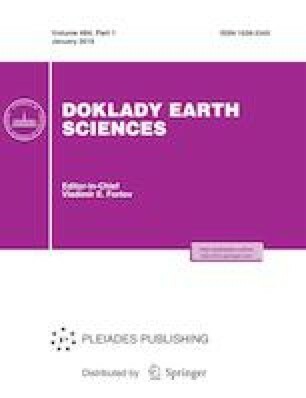 The results of U–Pb-isotopic dating of detrital zircons from sandstones of the Proterozoic Pogor’uy Formation, occurring to the north and south of the East Angara block of Yenisei Ridge, are presented. The sandstones of the northern part of the East Angara block are dominated by Archean and Paleoproterozoic populations of detrital zircons, while the samples from the southern part of the East Angara block have been revealed up to 25% of Mesoproterozoic age grains. The detrital zircon ages allow limiting the maximum sedimentary age of the Pogor’uy Fm. and the entire interval of its formation to 1.2–0.9 Ga. The paleogeographic features of the Pogor’uy Fm. deposition in the context of the existing opinions on the location of Siberia within the Rodinia supercontinent were examined. This work was carried out in accordance with plans of fundamental research of the Geological Institute, Russian Academy of Sciences (theme 0135-2016-0009 for N.B. Kuznetsov and 0135-2016-0004 for S.V. Rud’ko). Synthesis of materials for the YR, collection of stone material, its preparation for analytical studies were carried out with the financial support of the Russian Science Foundation (project no. 14-27-00058), the Ministry of Education and Science of the Russian Federation (contract No. 14.Z50.31.0017 of the Schmidt Institute of Physics of the Earth, Russian Academy of Sciences), and a grant of St. Petersburg State University (project no. 3.38.137.2014). Isotope study was supported by Australian Research Council grant ARC DP120104004 to WJ Collins.